With this project, we weren't trying to, like, "do telepresence" so much as we just wanted to find a way to let people affect the actual Sun Valley landscape. Rather than telling people what steak tastes like, I wanted them to be able to taste the steak. Instead of using the (small) summer marketing budget on banners and facebook ads, we proposed an earned media project. 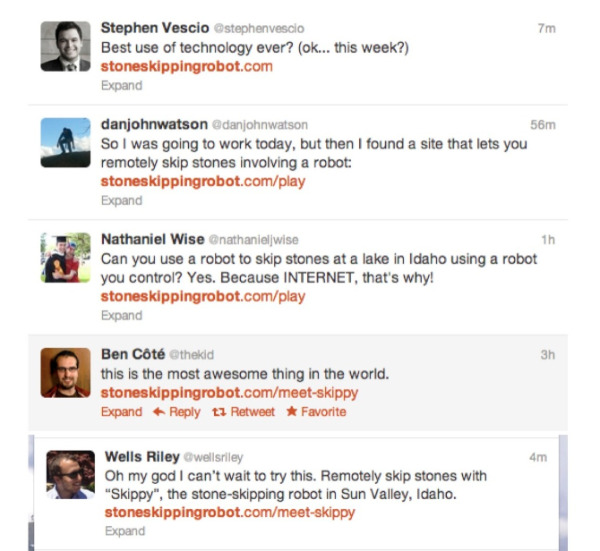 Specifically, a robot that would let people skip stones on a lake in Sun Valley from their computers, in real time, and watch the whole thing live. The thing about selling in the idea of a stone skipping robot is then you have to build a stone skipping robot. And find the right lake. And pump in satellite internet. And so we did. And it worked great. After setting the release angle and adjusting the power, people could watch their skip in real time, then get a playback video link to share on twitter and facebook. 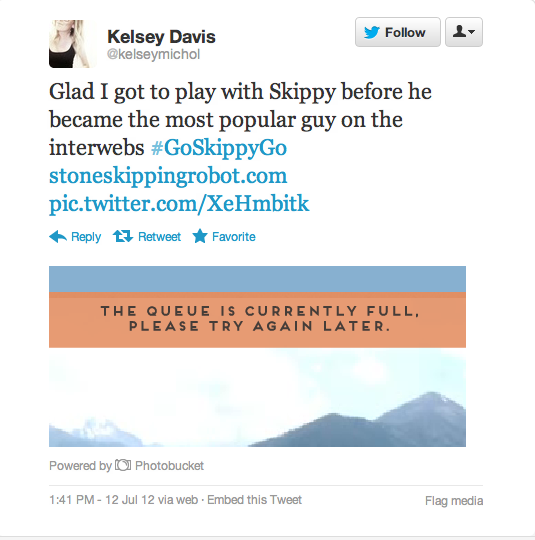 A few weeks before go-time, we put up a teaser site and I wrote this "Meet Skippy" teaser video to seed the idea. Mashable and Fast Co. on launch day. Then Skippy made the front page of Reddit...and things went a bit bananas. Skippy in the news! On Fox's Right This Minute. And they hit all our talking points. Woot. And all that attention, and all the tweeting, was cool for Skippy, but the best part was people spending something like 5 minutes on average staring at live video feed of a lake and some mountains in Sun Valley in the summertime. And getting a good idea what it's like to be there. And picturing themselves there. Which was totally the point.